The short answer is: It depends. It’s kind of like asking how much will you spend at the grocery store. Are you buying hamburger and lemonade or filet mignon and champagne? Remodeling an existing kitchen is job that’s full of variables, so sit down and start listing what you need and what you want. Now sort choices into three categories: must-have, would-love-to-have and would-like-to-have. 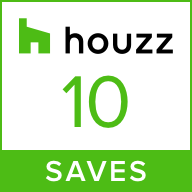 This will give you a little clarity, and if you need to, it will help you pare down the budget by prioritizing the features and options in your new kitchen. Thinking things out ahead of time will save you money – last minute add-ons generally cost more than if they were incorporated in the original plan. Stay realistic; keep your budget in mind. When it comes to setting a budget, a good rule of thumb for kitchen remodels is about 10% of the current value of your home. HomeAdviser.com reports that an average kitchen remodel costs around $20,000, with a median range of $11,500 to $29,000. Try to balance your budget between what you’re comfortable spending with what you’re dreaming about. And while you may not be able to afford that filet mignon and champagne, you probably can swing a T-bone and a nice cabernet. The estimates of what you’ll recoup on a kitchen remodel go from about 70% up to 100% and beyond but you can probably count on getting back between 85-90% of the cost at resale. Most experts say that it’s the most desirable remodel project and has the greatest return-on-investment. A new kitchen will also affect the speed at which your home sells; it will often be the number one reason why a home sells quickly. 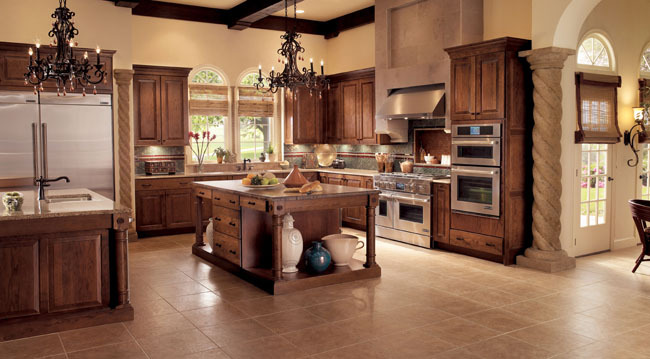 Cabinets and countertops should top the list but don’t forget appliances, flooring, lighting, electrical and plumbing. Are there any specialized cooking, cleaning or refrigeration options you want? At Carolina Kitchen & Bath, we offer Merillat Cabinetry, with popular features like glass cabinet doors, pull-out trays in the base cabinets, storage space for small appliances and decorative elements like plate racks, light rail and crown molding. Searching the web for information is a good start, but because a kitchen remodel is such a complex process, you need experienced professionals to guide you from design to completion. Email us, call our showroom at 336-545-9995 or stop by and talk to one of our staff members today. At Carolina Kitchen & Bath, we’ll show your products and designs that will offer you a great value and inspire your imagination! The CoreGard sink base is truly a Masterpiece! Drip, drip, drip. Whether or not you hear that sound, you may not discover a leak under your sink for a few days, or a few weeks. By the time you do, there’s a big water stain on the bottom of your sink cabinet – or worse. Merillat Cabinets has come out with a solution to that with their CoreGuard sink base. The body of the cabinet is made from an engineered polymer that isn’t damaged by leaks or spills. 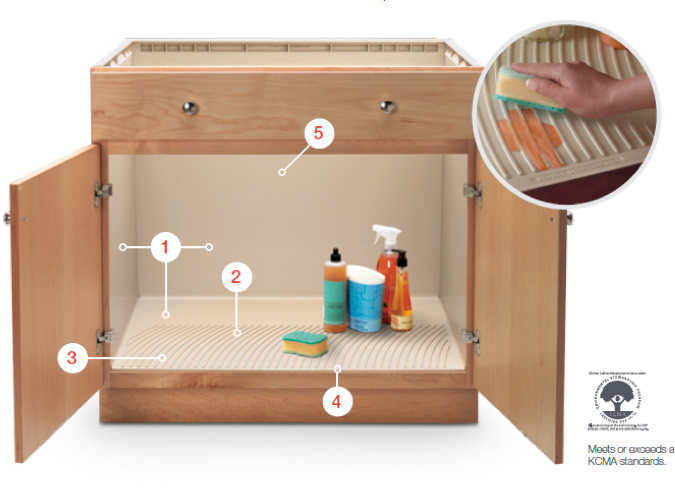 It has a sloped bottom so any liquid will flow to the front of the cabinet where you’re more likely to see it, and caught by a plastic lip so the leak is contained and your cabinet stays beautiful, inside and out. The bottom of the cabinet is corrugated, to raise up any stored items and keep them dry. Come in today and see what kind of cabinet options are available for your kitchen. Merillat has so many beautiful products and smart conveniences; let us introduce you. 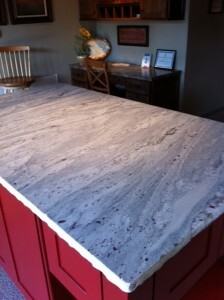 We have our new “honed” granite display installed. The granite is Glacier White – a pretty white with grey shading and cranberry spots. The edge is “chiseled” quite different from the usual edge treatments. Today Carolina Kitchen & Bath is pleased to announce the launch of a brand new website. With our focus on customer satisfaction, we are always looking for ways to help consumers through their journey to finding that new kitchen or bathroom design . Our new website allows consumers the ability to interact with us digitally by giving them the opportunity to view our showroom as well as various kitchen and bathroom ideas that will help them get a sense for the style they’re looking for. Website visitors will also be able to get a sense for the industry leading brands we carry as well as our commitment to quality through the professional design consultations that can be requested right there on the site from one of experienced designers. The new website also explains in detail the Carolian Kitchen & Bath design process as well as the other services we offer to our clients such as professional installation and commercial design services.